An old friend always used to say “ang babaw ng kaligayahan mo” meaning, literally, “your happiness is so shallow”. That does not fully explain the meaning of the phrase though for it actually means that I find happiness in the most inconsequential things; finding a good bargain, for instance, would totally make my day. 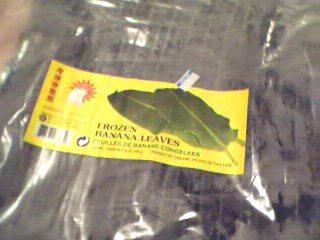 On a recent foray to the Mexican tienda (market) I came across this pack of frozen banana leaves. Though not necessarily a bargain considering banana leaves can be had for free from my grandmother’s backyard back in the day, I am still excited because I have been meaning to try some banana wrapped recipes that I’ve spied in other blogs, and now I can! Coming soon in our kitchen, something wrapped in these…. It’s a good thing 🙂 as Martha would say. Oh, you just reminded me of the plancha! I may have to blog this soon 🙂 I can’t wait to make something with these. I’m contemplating suman even though I’ve never made them before. JMom! i understand completely *highfive* i don’t mean to be so arrogant(i take it for granted,!, sorry!, until i read about how other bloggers have a hard time finding them) when i post such “exotic” ingredients but banana leaves (though of course much better freshly cut and washed…especially used as the tablecloth/plates for “kamay kainan” eating-by-hand picnics)….indispensable! i love the scent of it as it’s warmed…i remember it was used as a resting place for our iron(plancha).